Sean Rafferty with a lively mix of chat, arts news and live performance. His guests include Studio de musique ancienne de Montreal, Maria Pages and Lisa Ueda. Sean Rafferty with a lively mix of chat, arts news and live performance. Sean's guests include Studio de musique ancienne de Montréal, who perform ahead of their concert at St John's Smith Square, and choreographer María Pagés to talk about Yo Carmen at Sadler's Wells' Flamenco Festival. 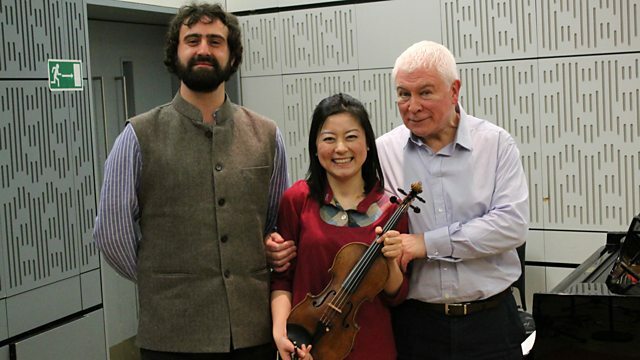 Violinist Lisa Ueda performs live with pianist Daniele Rinaldo to talk about their debut CD release. Ensemble: Les Boréades de Montréal. Conductor: Francis Colpron. Choir: Studio de musique ancienne de Montréal. Singer: Elīna Garanča. Orchestra: Orchestra Sinfonica Nazionale della RAI. Conductor: Karel Mark Chichon. Performer: Carles Trepat. Performer: David Tummer. Ensemble: Casals Quartet. Performer: Lisa Batiashvili. Music Arranger: Tamás Batiashvili. Orchestra: Chamber Orchestra of Europe. Conductor: Yannick Nézet‐Séguin. Singer: Iestyn Davies. Singer: Carolyn Sampson. Performer: Joseph Middleton. Lost is my Quiet: Duets and Solo Songs. Music Arranger: Fritz Kreisler. Performer: Kyung-wha Chung. Performer: Phillip Moll. Brahms/Kreisler/Elgar: Con Amore: Kyung Wha Chung. Performer: James Taylor. Performer: Donald Sulzen. Orchestra: Staatskapelle Dresden. Conductor: Giuseppe Sinopoli. Performer: Lisa Ueda. Performer: Daniele Rinaldo. Choir: The Choir Of Trinity College, Cambridge. Conductor: Richard Marlow. Singer: Ella Fitzgerald. Singer: Louis Armstrong. Conductor: Russell Garcia. Orchestra: Russell Garcia's Orchestra.